You've already seen the results of my scraplifting exploits, and now it's time for sketches! I enjoy reading the Sketchy Thursdays blog, and finally got a chance to tag along! Journaling reads: We had crazy amounts of tomatoes this year. The average amount was a full bowl! In other news, I am thinking a lot about life and directions and plans. About how as much as I'd like to see a printout of what's to come, I'm starting to feel more peace about where I am right now. Where will I be in a year from now? I have absolutely no idea. Change is scary. Change is hard. But all of the major changes in my life so far have been for the better. And so will this be. Love the layout...you have such a fun style! Don't sweat it....life always has a way of working itself out...and I'm betting you'll be just fine! 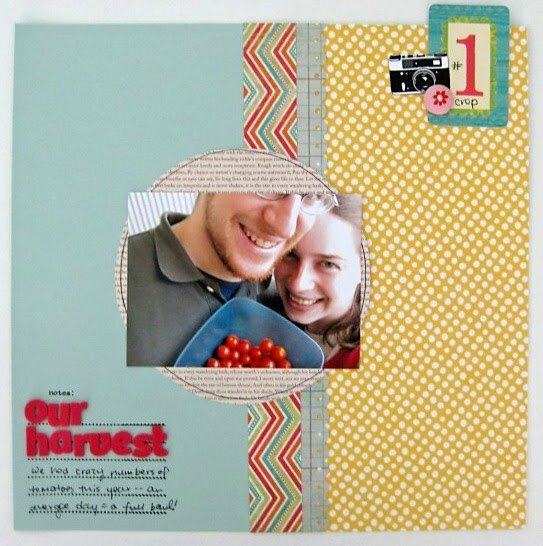 Cute layout- fabulous work with the sketch! I've been meaning to try those sketches...so many sketches so little time. Love your take. Adorable page, girlie!!! So glad you are playing along with us. Hope to see more of you over on ST!! I love the cropped photo - great take on this sketch. change is good. *hugs* embrace life.. you're awesome as it is already, girl. wonderful take on the sketch!!! your layout is great! Oh girl--- you are speaking my language with your philosophizing. Change IS hard, dang it!!! but good.... in the long run. Great sketch -- and I love what you did with it. Those colors POP! Hi Keshet - thanks for your comment today! Yes, the ATG is enormous compared to the little glue runners. It takes some getting used to, and it also takes a certain 'flick of the wrist' thing to get the adhesive to "let go" of the roll - but that could just be the result of user error ;) Definitely a bargain, though - for the quantity you get and it's really strong adhesive. Such a fabulous take on that sketch! Love it!